Scientists like to classify things. 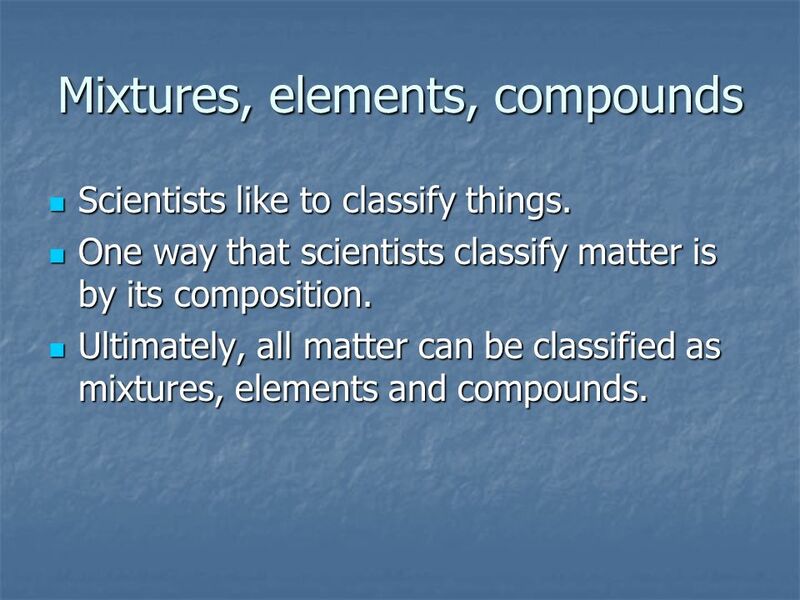 One way that scientists classify matter is by its composition. Ultimately, all matter can be classified as mixtures, elements and compounds. 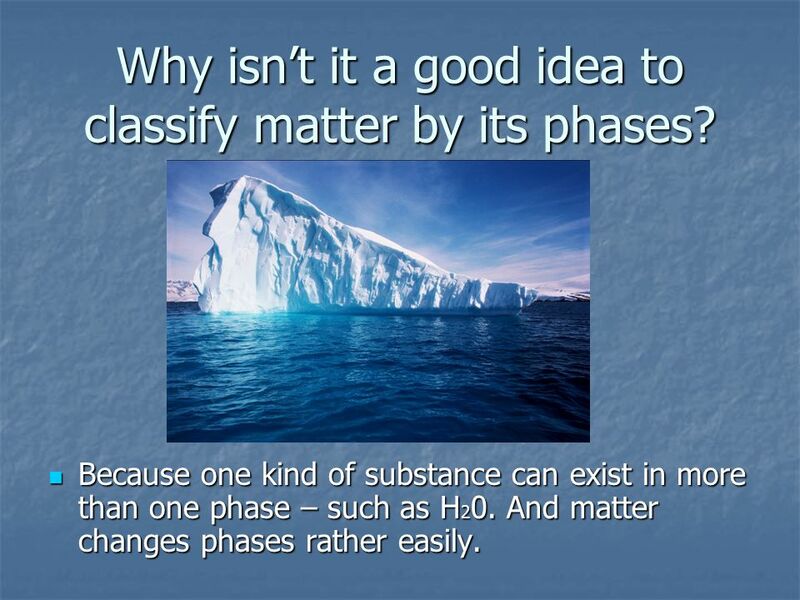 4 Why isn’t it a good idea to classify matter by its phases? Because one kind of substance can exist in more than one phase – such as H20. And matter changes phases rather easily. 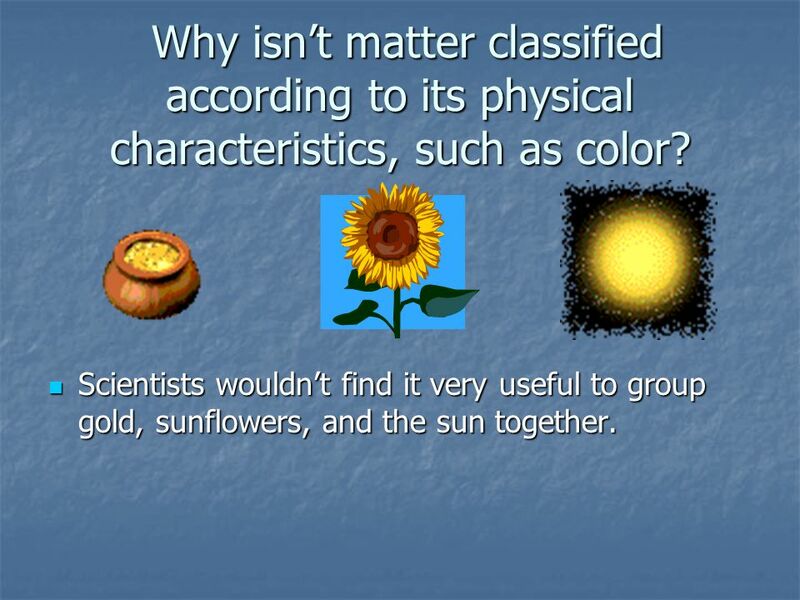 5 Why isn’t matter classified according to its physical characteristics, such as color? Scientists wouldn’t find it very useful to group gold, sunflowers, and the sun together. 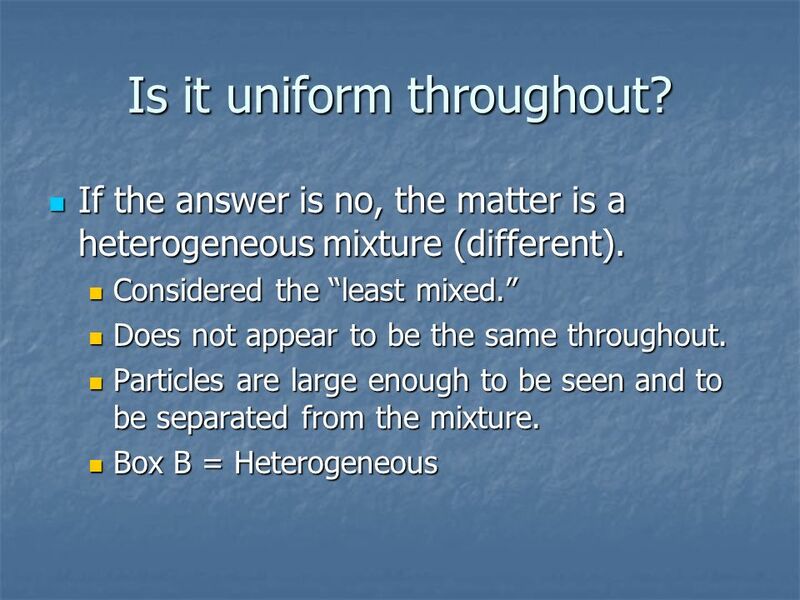 Is the matter uniform throughout? Can it be separated by physical means? 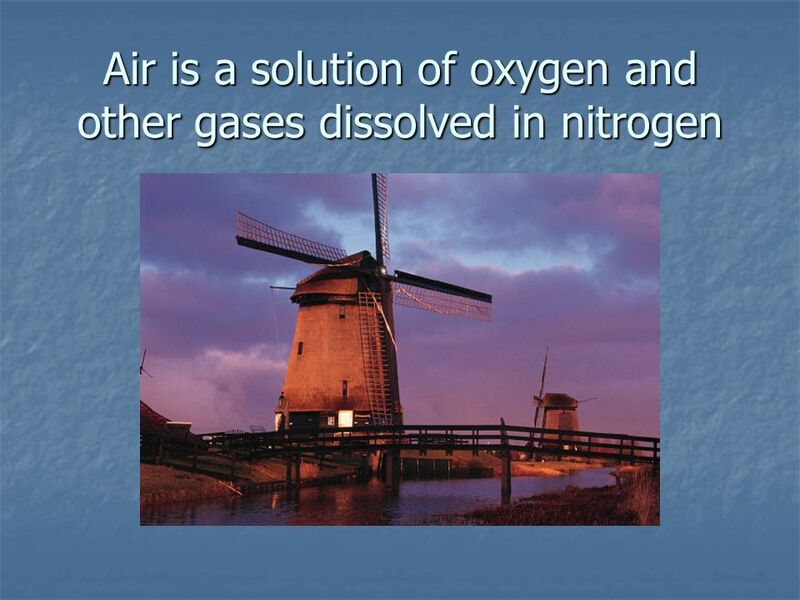 Can it be separated by chemical means? Mixtures – two or more substances that are not chemically combined with each other and can be separated by physical means. The substances in a mixture retain their individual properties. Solutions – a special kind of mixture where one substance dissolves in another. 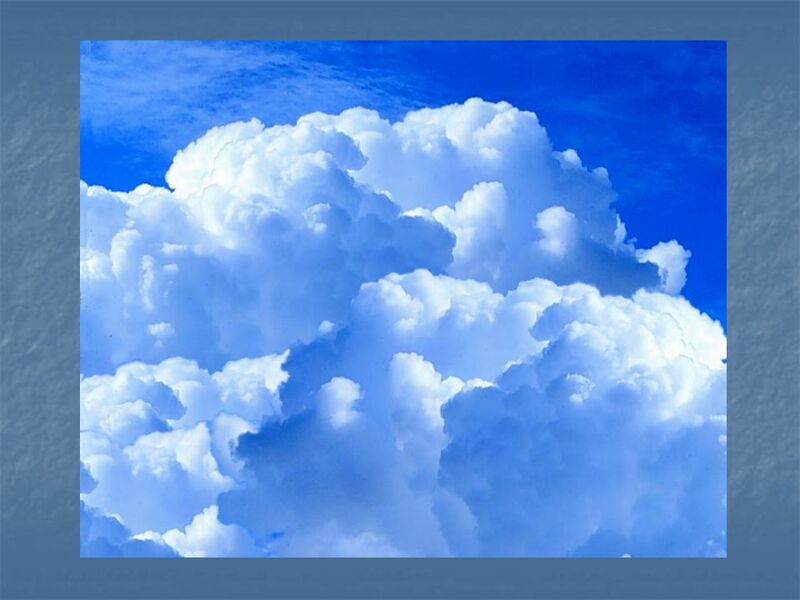 Elements – simplest form of pure substance. They cannot be broken into anything else by physical or chemical means. 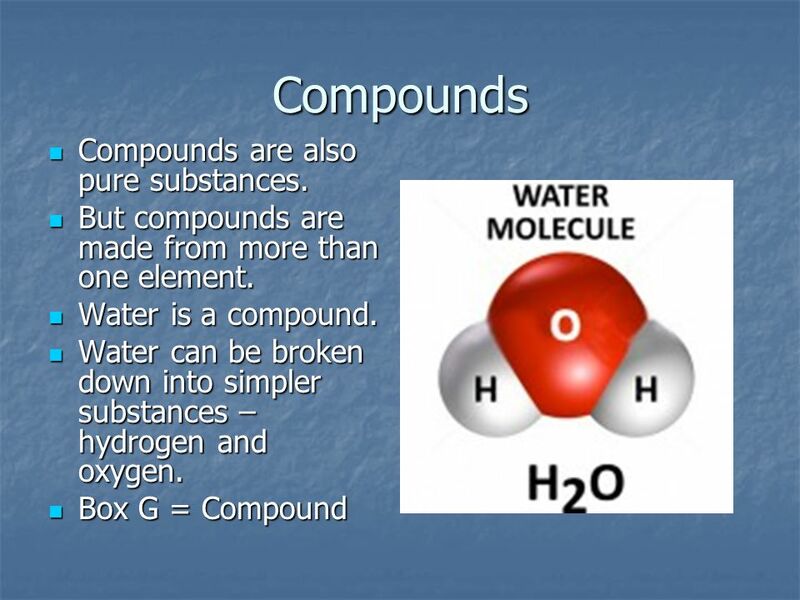 Compounds – pure substances that are the unions of two or more elements. They can be broken into simpler substances by chemical means. 8 Is it uniform throughout? 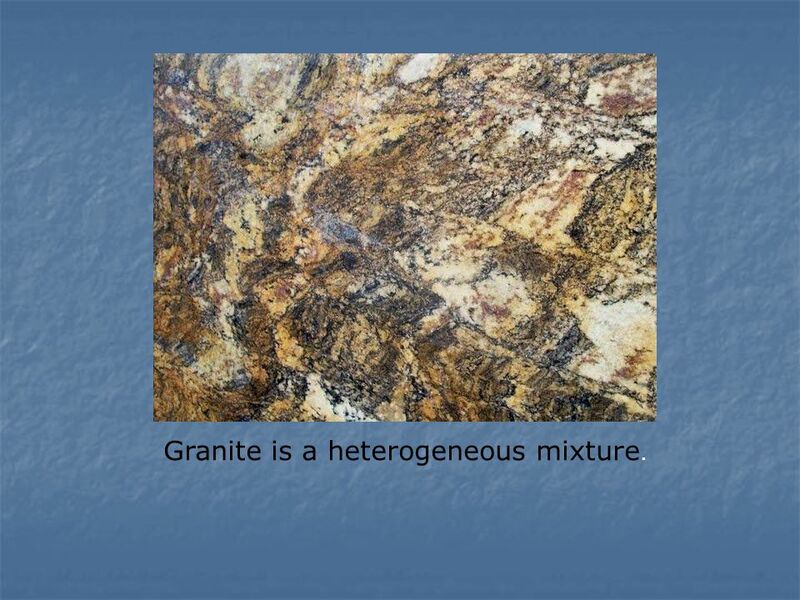 10 Granite is a heterogeneous mixture. 11 Is it uniform throughout? 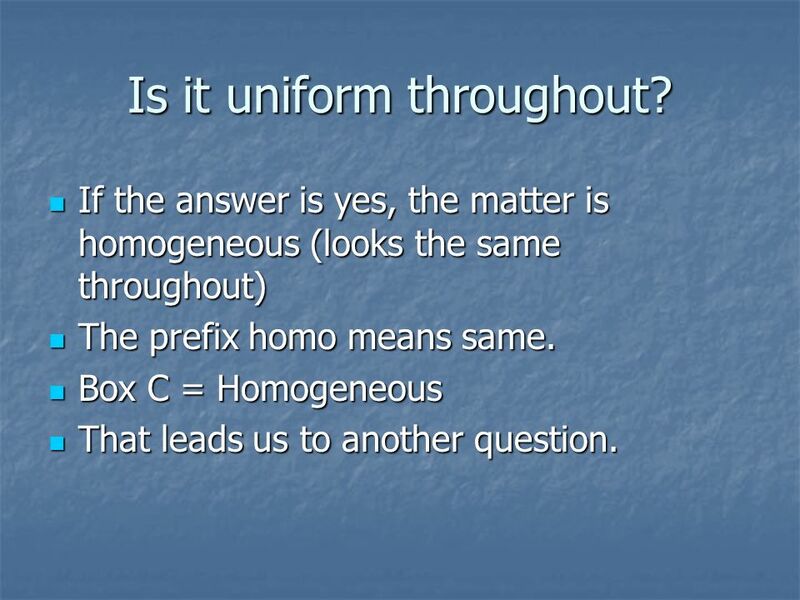 If the answer is yes, the matter is homogeneous (looks the same throughout) The prefix homo means same. Box C = Homogeneous That leads us to another question. 12 Can it be separated by physical means? 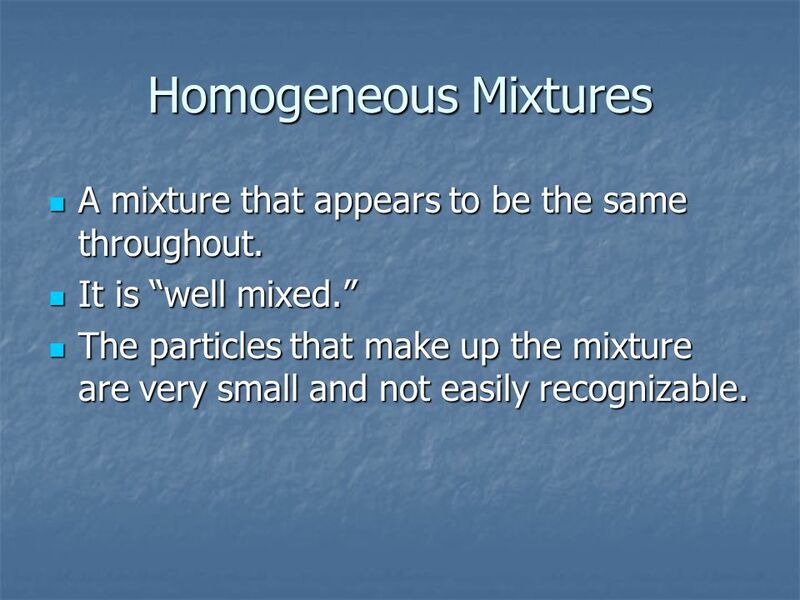 13 Homogeneous Mixtures A mixture that appears to be the same throughout. It is “well mixed.” The particles that make up the mixture are very small and not easily recognizable. 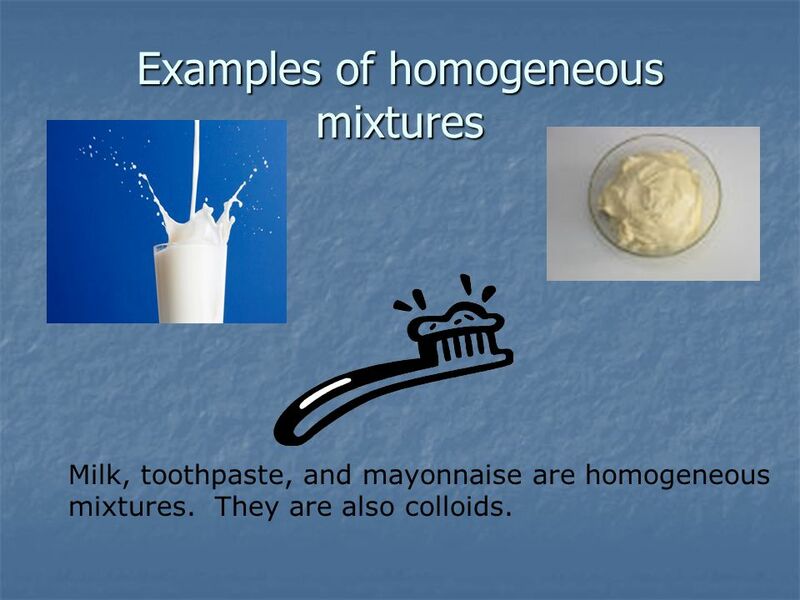 Milk, toothpaste, and mayonnaise are homogeneous mixtures. 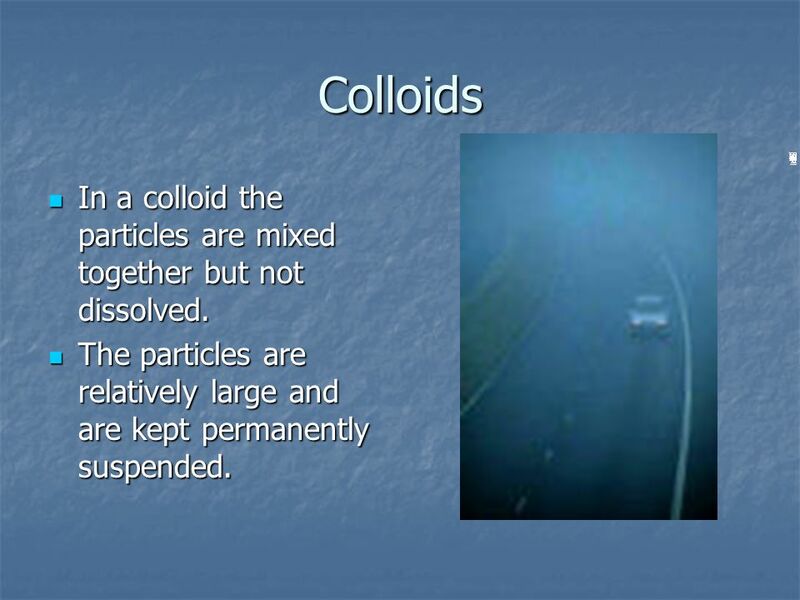 They are also colloids. 15 Colloids In a colloid the particles are mixed together but not dissolved. The particles are relatively large and are kept permanently suspended. 16 Colloids A colloid will not separate upon standing. 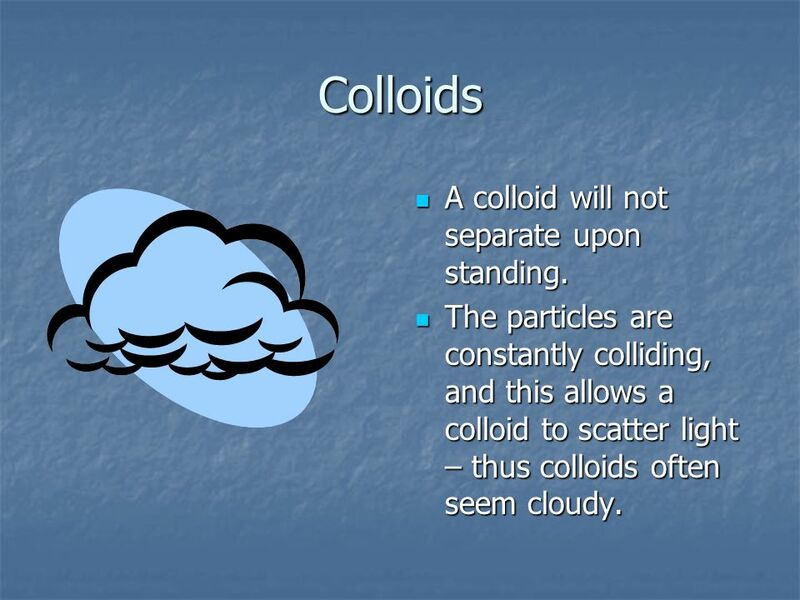 The particles are constantly colliding, and this allows a colloid to scatter light – thus colloids often seem cloudy. 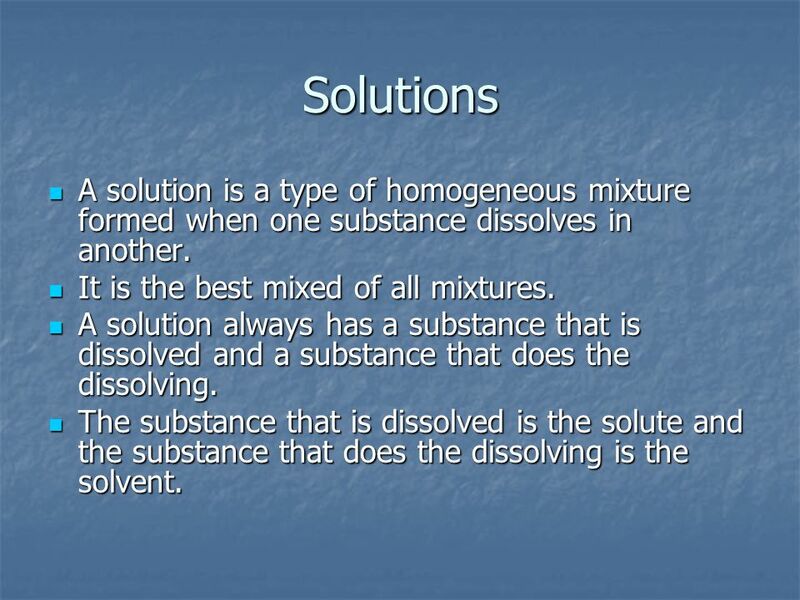 18 Solutions A solution is a type of homogeneous mixture formed when one substance dissolves in another. It is the best mixed of all mixtures. A solution always has a substance that is dissolved and a substance that does the dissolving. 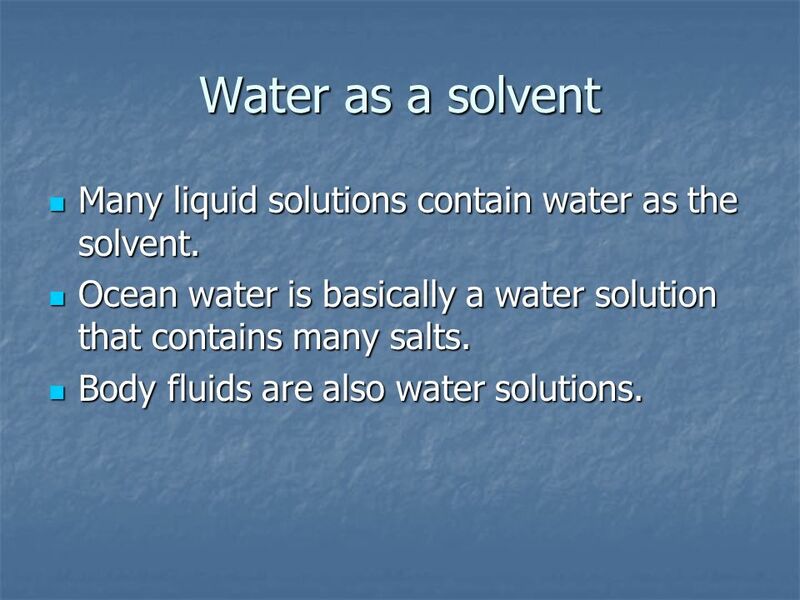 The substance that is dissolved is the solute and the substance that does the dissolving is the solvent. 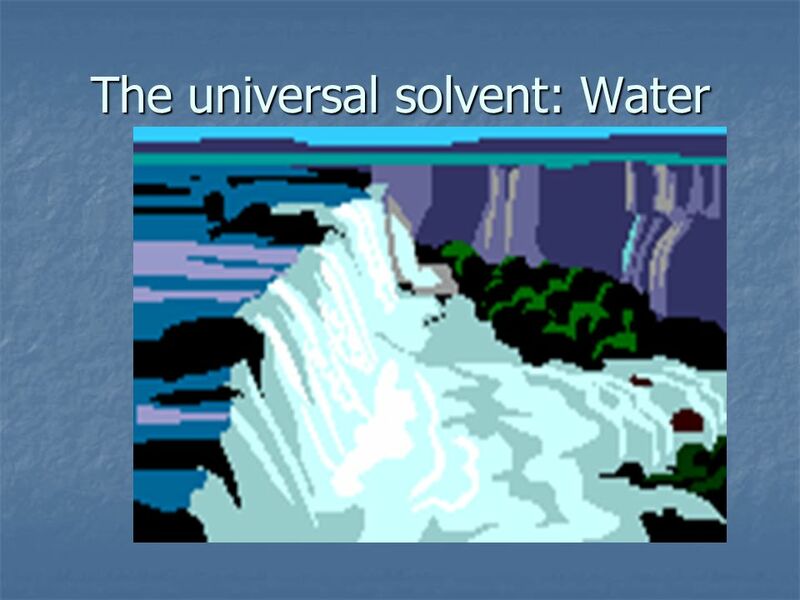 21 Water as a solvent Many liquid solutions contain water as the solvent. 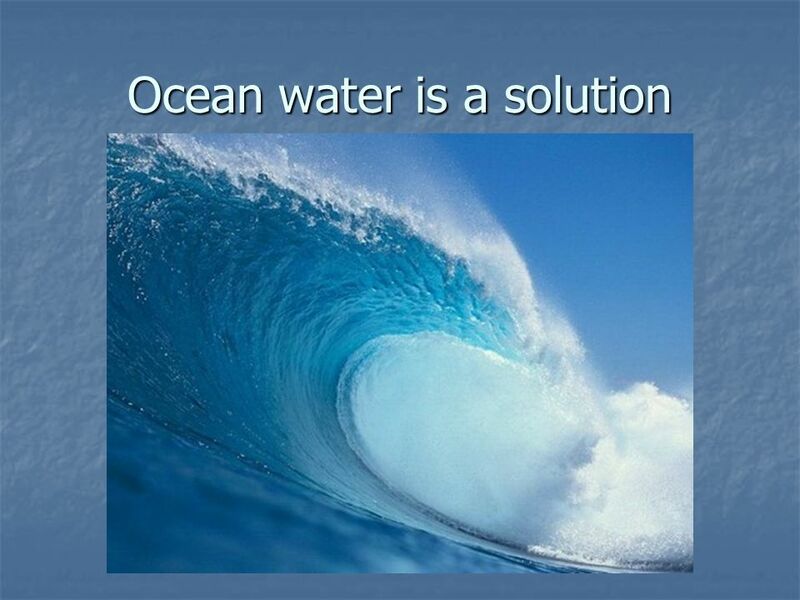 Ocean water is basically a water solution that contains many salts. Body fluids are also water solutions. 22 Metals dissolved in metals are called alloys. 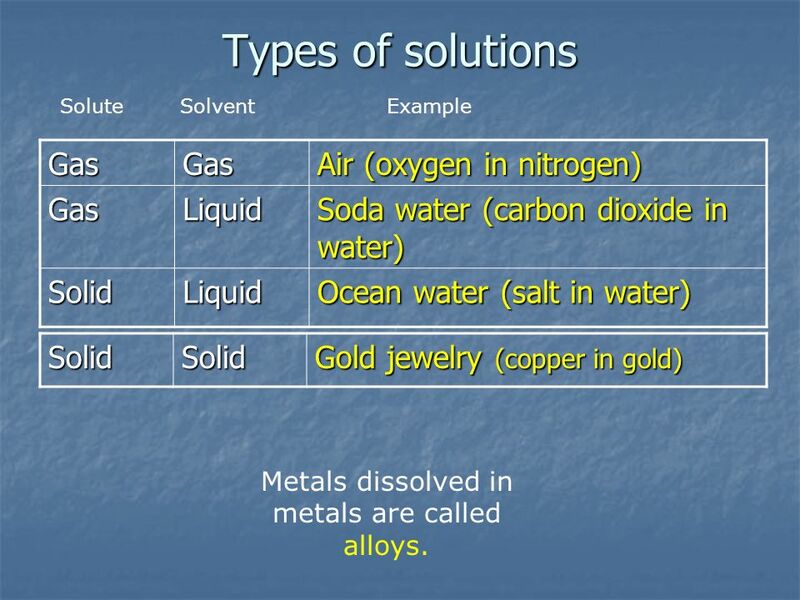 Types of solutions Solute Solvent Example Gas Air (oxygen in nitrogen) Liquid Soda water (carbon dioxide in water) Solid Ocean water (salt in water) Solid Gold jewelry (copper in gold) Metals dissolved in metals are called alloys. 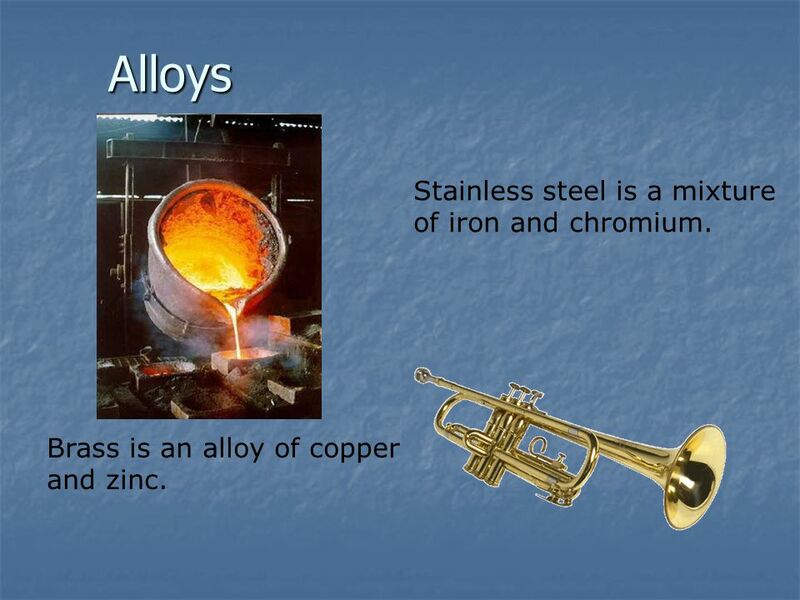 24 Alloys Stainless steel is a mixture of iron and chromium. 25 Can it be separated by physical means? 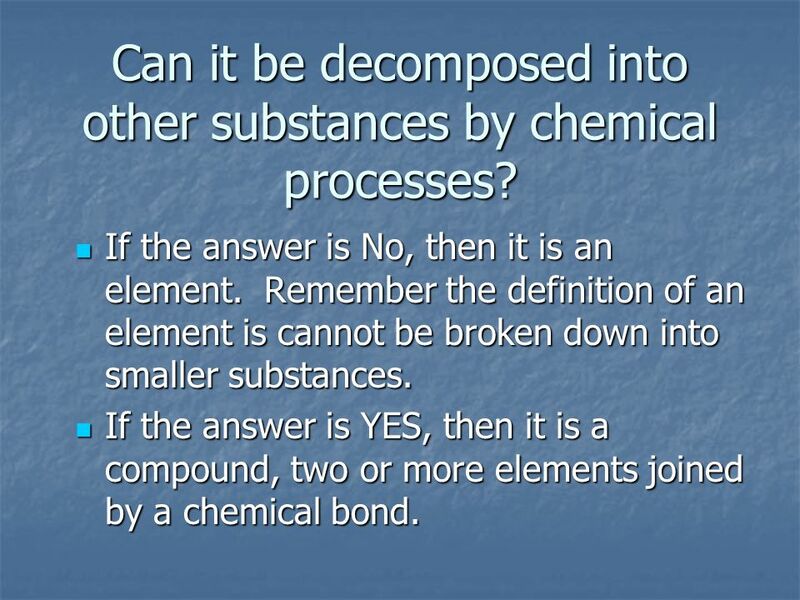 26 Can it be decomposed into other substances by chemical processes? If the answer is No, then it is an element. 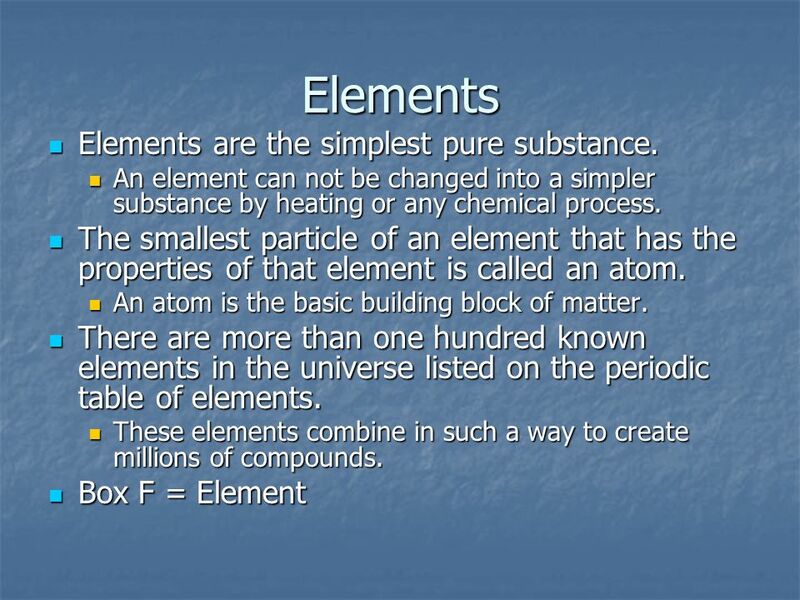 Remember the definition of an element is cannot be broken down into smaller substances. 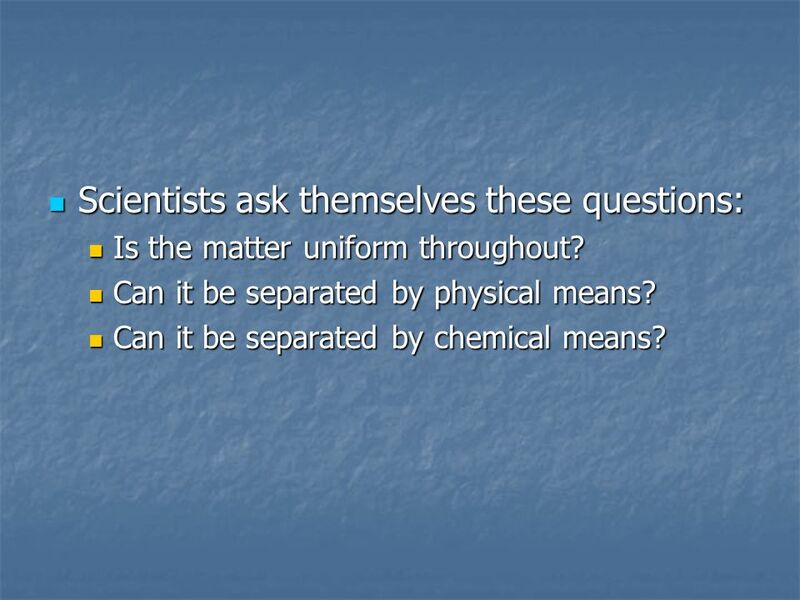 If the answer is YES, then it is a compound, two or more elements joined by a chemical bond. 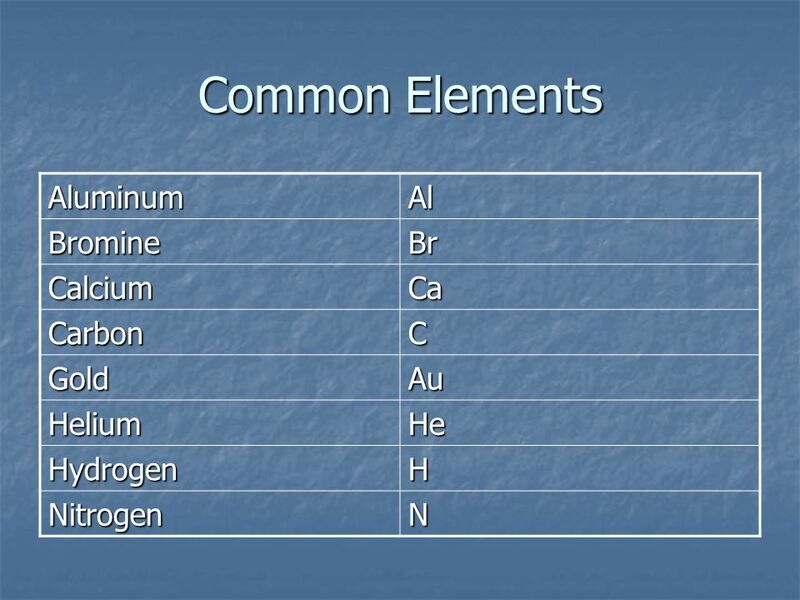 27 Elements Elements are the simplest pure substance. 28 Elements All elements are made of atoms. Atoms of the same element are alike. 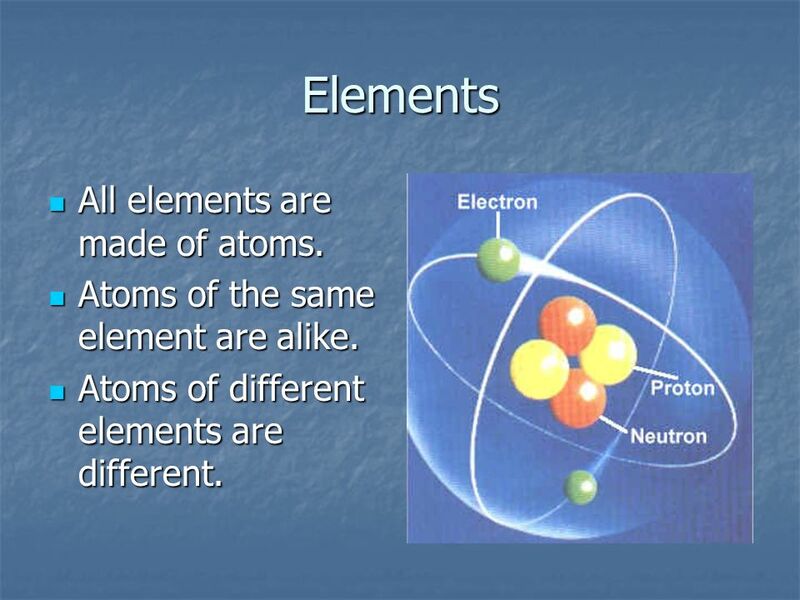 Atoms of different elements are different. 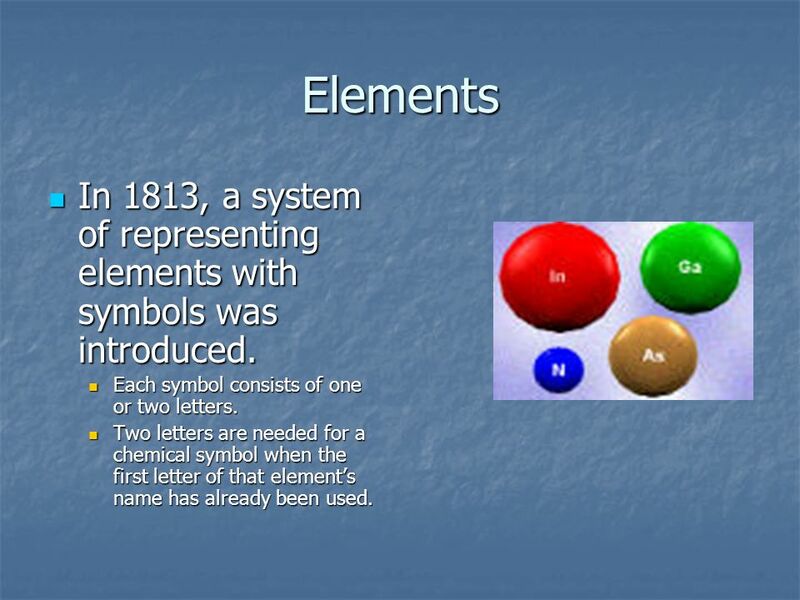 29 Elements In 1813, a system of representing elements with symbols was introduced. Each symbol consists of one or two letters. Two letters are needed for a chemical symbol when the first letter of that element’s name has already been used. 31 Compounds Compounds are also pure substances. Download ppt "Mixtures, Elements and Compounds"
Chapter 4 P Mixtures, Elements and Compounds. Chapter 15 Section 1 Composition of Matter. Chapter 4 Notes Mixtures & Solutions. Properties of Matter. 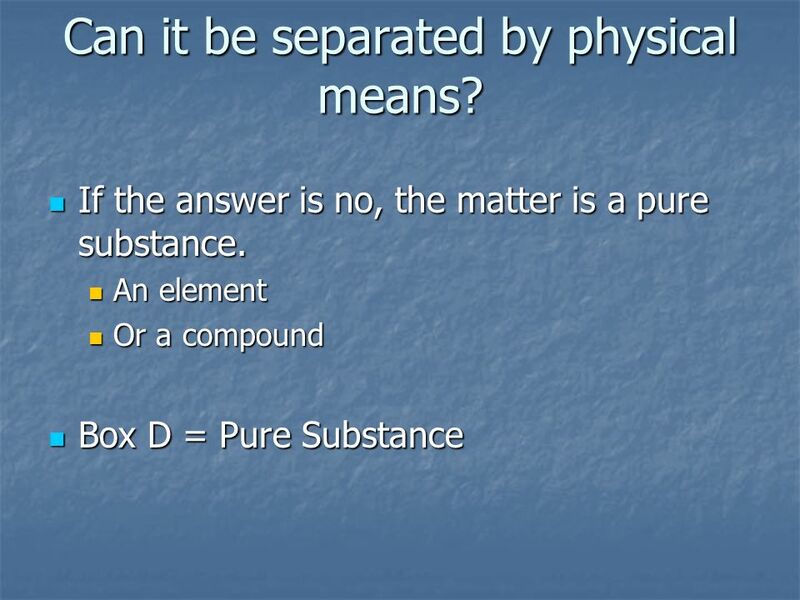 2.1 Classifying Matter  Why do we classify matter? 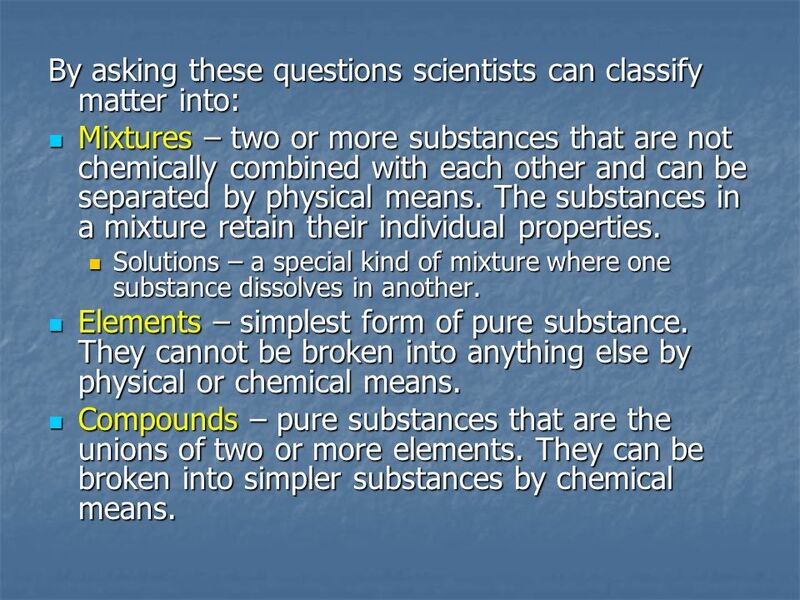  Different substance have different properties  How do we classify matter? 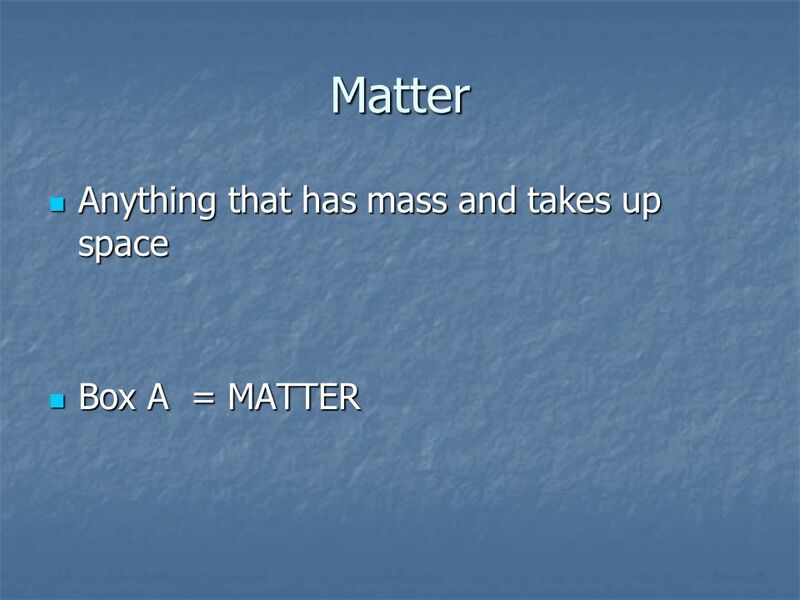 More about Matter Use the information on these slides to check and improve your organization of matter. Properties of Matter 2.1 Classifying Matter. 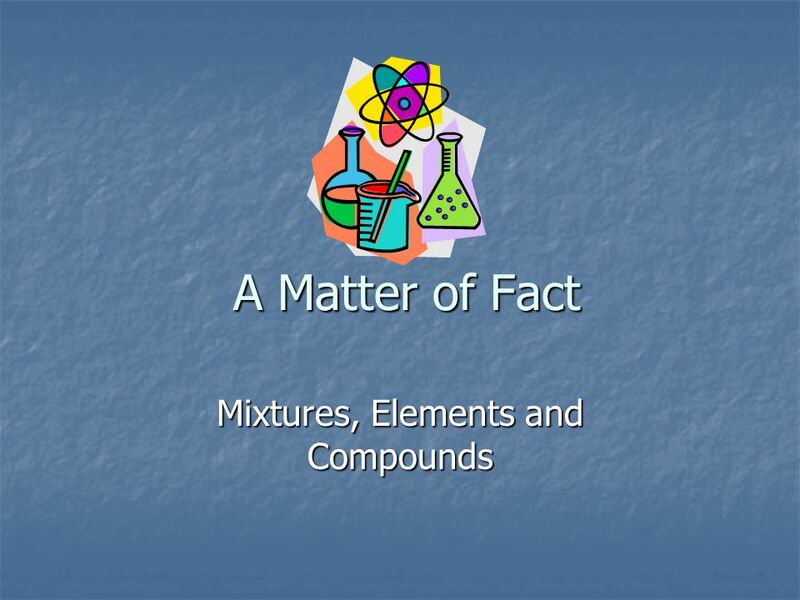 A MATTER OF FACT Introduction to Elements, Atoms, and the Periodic Table. Topic of the Week:  Mixtures, Solutions, and Suspensions Homework : read section pgs 96 – Section Review SWBAT : list the four categories of matter. 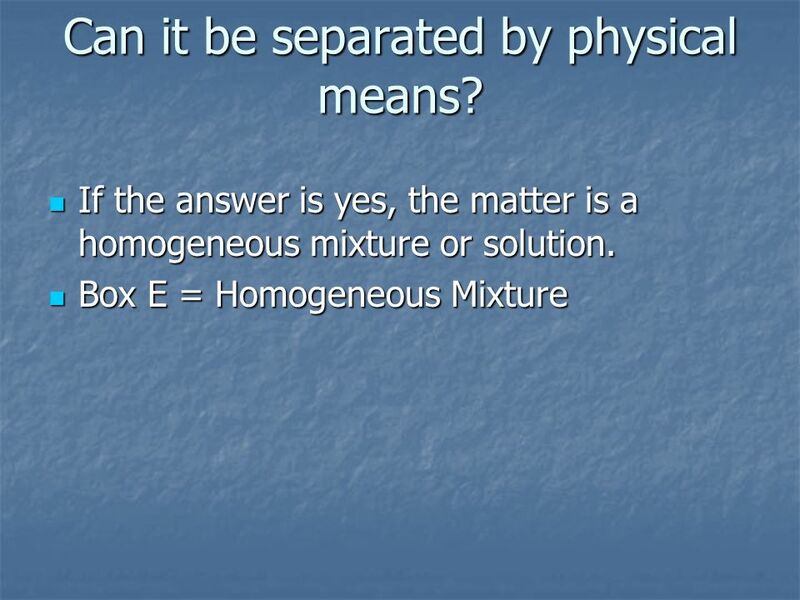 A Matter of Fact Mixtures, Elements and Compounds. 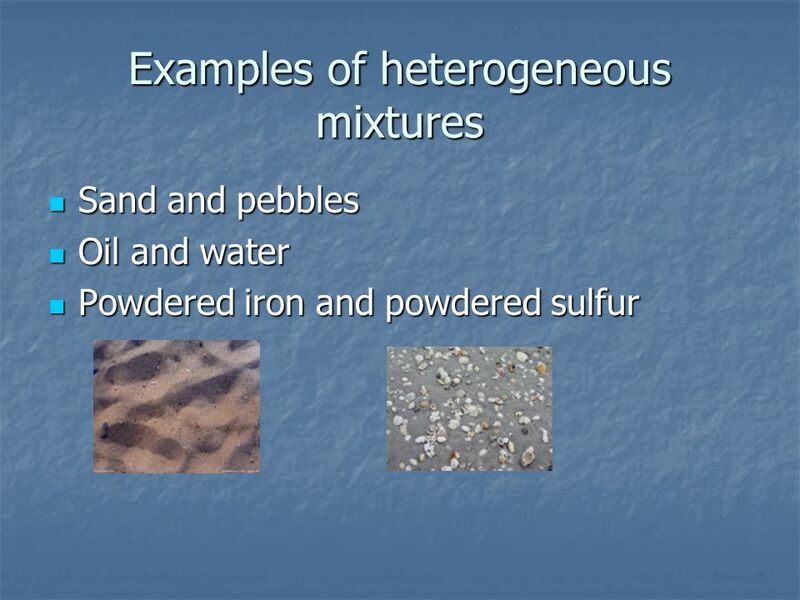 A Matter of Fact Mixtures, Elements and Compounds Adapted from: education.jlab.org/jsat/.../elements_compounds_mixtures.ppt.